In order to obtain a good audio reproduction at different listening levels, a different tone-controls setting should be necessary to suit the well known behavior of the human ear. In fact, the human ear sensitivity varies in a non-linear manner through the entire audible frequency band, as shown by Fletcher-Munson curves. Fortunately, the human ear is not too critical, so a rather simple circuit can provide a satisfactory performance through a 40dB range. The circuit is shown with SW1 in the "Control-flat" position, i.e. without the Automatic Loudness Control. In this position the circuit acts as a linear preamplifier stage, with the voltage gain set by means of Trimmer R7. 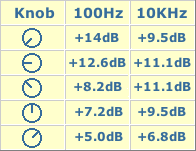 Switching SW1 in the opposite position the circuit becomes an Automatic Loudness Control and its frequency response varies in respect to the position of the control knob by the amount shown in the table below. C1 boosts the low frequencies and C4 boosts the higher ones. Maximum boost at low frequencies is limited by R2; R5 do the same at high frequencies. R7 should be set to obtain maximum undistorted output power from the amplifier with a standard music program source and P1 rotated fully clockwise.